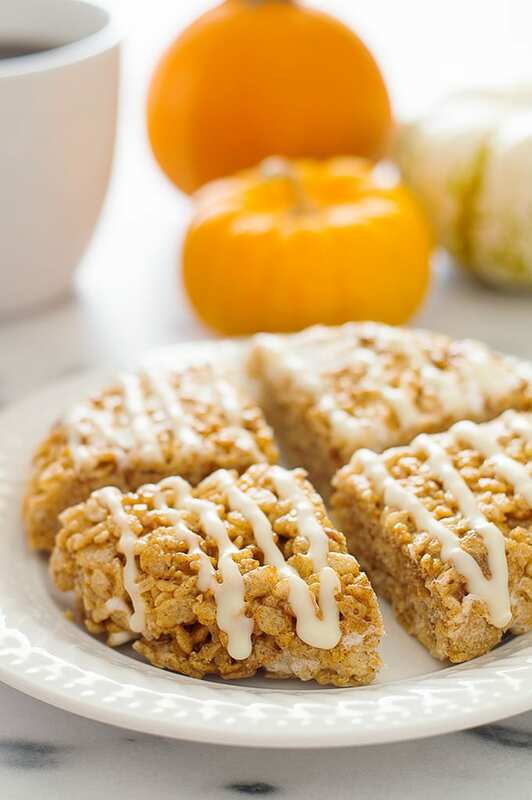 You can make these Small-batch Pumpkin Spice Rice Krispie Treats in just a few minutes for a simple, fun fall dessert. Fall is officially here!! The leaves are starting to change, evenings are cooling down, and while it’s not sweater weather here yet, I’ve already spent waaaaay too many hours sweater shopping online (#1 on my wishlist? A perfect slouchy sweater with elbow patches–I NEED IT). Anyway, fall is the season of pumpkin spice, and yes, I’ve already made a few pumpkin spice recipes this season, my Pumpkin Spice Latte Recipe (!!!) and Pumpkin Donuts With Maple Glaze (my fav forever and ever), but you’re about to get one more, Pumpkin Spice Rice Krispie Treats! 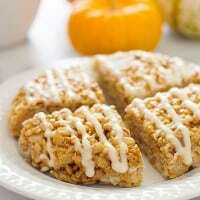 Why Pumpkin Spice Rice Krispies? Because it’s fall, and as a food blogger, I am contractually obligated to add pumpkin spice to all things this time of year. And because rice krispies, while delicious just the way the are, always make me want to dress them up a bit. And they do look so cute all dressed up with pumpkin, pumpkin spice, and white chocolate. 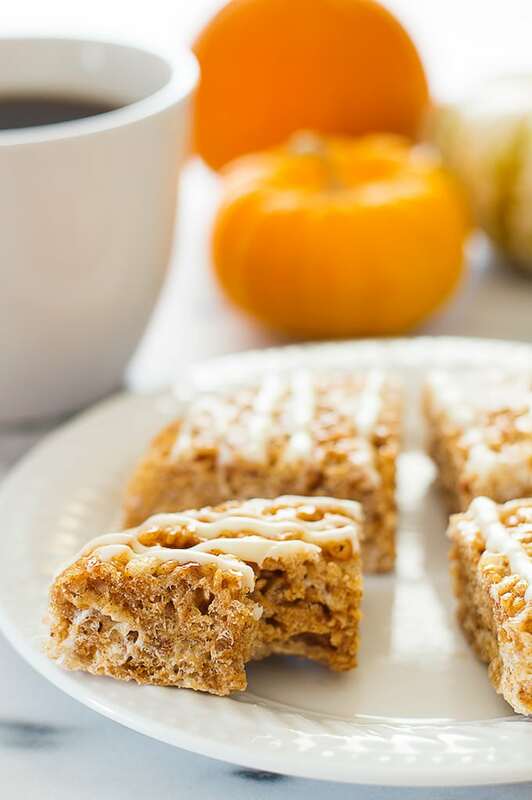 Plus, this is just a recipe for small-batch pumpkin spice rice krispies, so they are quick to make and you wont overindulge. This recipe will make four servings, which I think is the perfect number of servings, two for you, two for someone you like (or two for the you of tomorrow). It also uses real pumpkin puree, but just a tablespoon, so it’s perfect if you are down to the bottom of a can of puree and need to get rid of the stuff! As I’ve covered before, pumpkin puree has a ton of moisture in it, which can cause the rice krispies to become soggy. So I used the same technique that I used for my Pumpkin Shortbread Cookies, of squeezing out some of the puree’s moisture between two paper towels. It’s super easy and takes care of the sogginess problem! I am completely in love these treats and they are just the sort of easy-to-throw-together dessert that can really pick up a boring evening. Give them a try! This recipe only uses a tiny fraction of a can of pumpkin puree. Check out my post What to Do With Leftover Pumpkin Puree for some ideas on what to do with the all the leftovers. Lightly grease a small dish (I used a 6-inch round Pyrex dish) or sheet of parchment paper. Drop pumpkin puree onto a couple layers of paper towels. Fold the towel over and squeeze out the moisture. Scrape the the puree onto a dry part of the towel and repeat once or twice more, until most of the moisture has been removed and you can pick up the puree with your fingers. In a medium pan, combine prepared puree, butter, cinnamon, nutmeg, ground cloves, and ginger. Heat over medium heat until butter is melted and whisk until mostly combined. Add 1 1/2 cup of the marshmallows and use a heat-proof rubber spatula to stir until mostly melted and combined. Remove from heat and stir in Rice Krispies and remaining 1/2 cup of marshmallows. Stir just until everything is well-mixed (some of the marshmallows will not completely melt). Transfer to your greased dish or drop onto lightly greased parchment paper. Cool completely, about 20 minutes. In a small microwave-safe bowl, heat milk for 10 to 20 seconds until steaming. Add chopped white chocolate and stir until melted. Drizzle over the rice krispies treats with a spoon or transfer to a disposable plastic bag and snip off one of the corners to "pipe" your chocolate. Allow another 10 minutes of cooling time before eating. 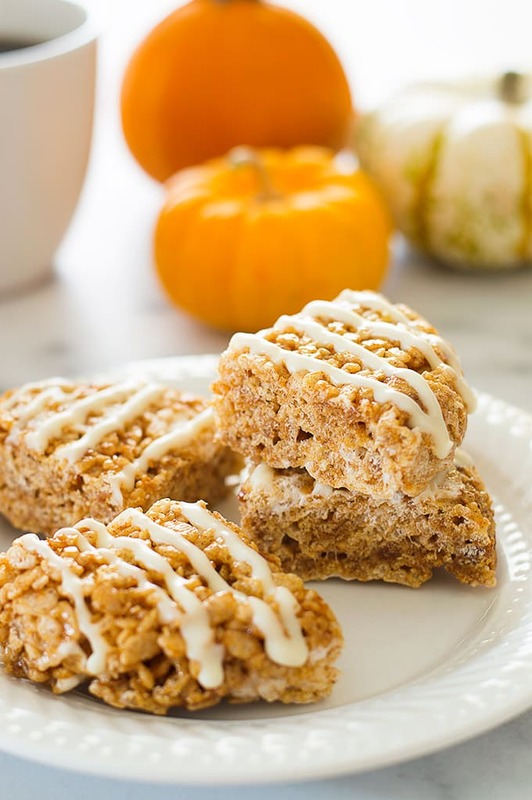 Ok, these rice krispie treats…..love ’em! Love the twist with the pumpkin… totally got a laugh from ‘or two for the you of tomorrow’ Sounds like a plan to me….hehehe. Pinned! Hope you have a fab weekend, Tracy! It totally is and I love it. 😉 Thanks, Jess! !